Congressman John Sarbanes (D-Md.) recently attended and spoke at this month's White House Roundtable where APA presented its latest Community Planning Assistance Team report. The report for the Baltimore community calls for using green infrastructure to increase resilience and promote revitalization. I was proud to join federal, state and local partners earlier this month for a roundtable hosted by the White House about building a greener and more sustainable future for the City of Baltimore. During the event, we highlighted efforts to improve residents’ access to city parks and other green spaces. In particular, we strategized about transforming the Middle Branch and its surrounding neighborhoods into a network of green spaces and trails. While the Inner Harbor has long been the focus of Baltimore’s developing waterfront, the Middle Branch has the potential to be our city’s Eco Harbor, with more equitable access to restored parks, trails, and natural habitat that invite nearby communities to learn about and enjoy our native wildlife. A key part of this network is Ridgely’s Cove, a public park site that’s on the doorstep of Camden Yards along the Gwynns Falls trail. Today, the park is filled with native plants and birds, a sign of its great potential. But its history as an industrial site has left the soil too contaminated for public use. Once restored as a nature park, Ridgely’s Cove could be the northern anchor for a greener, more accessible Middle Branch waterfront, ready to welcome pedestrians and cyclists, kayaks and canoes, students, birders and citizen scientists. Another key project is the Brooklyn/Baybrook Community Action Plan, led by The Conservation Fund and a team of volunteers from the American Planning Association. While the Brooklyn/Baybrook neighborhood is only a stone’s throw from the Middle Branch, it remains isolated from existing green spaces. But the Action Plan envisions a future for Brooklyn/Baybrook that is greener, healthier, and better protected against the growing challenge of stormwater flooding. That future includes the transformation of Garrett Park into a central hub that helps define the community, with places for recreation, education, community gardens, and wildlife habitat. There are a number of partnerships that are building support and finding the resources to invest in Baltimore’s community parks, natural habitats and green spaces. The Greater Baltimore Wilderness Coalition, which held its launch event at Ridgely’s Cove, is identifying and improving the network of green spaces in Baltimore, beginning with spotlight projects like Garrett Park. The U.S. Fish and Wildlife Service plans to expand the Urban Wildlife Refuge Partnership at Masonville Cove to cover more parts of Baltimore, unlocking opportunities for federal funding. And the City of Baltimore recently signed an Urban Bird Treaty agreement, pledging to protect our local birds while educating residents on the importance of preserving and monitoring bird populations. We know that improved access to outdoor spaces is good for local communities. It leads to better public health and stronger local economies. Students who get outside and learn about their local environment perform better in science, technology, engineering, and mathematics. And when communities learn about and engage with native habitats and wildlife, they become citizen stewards who are committed to preserving these valuable natural resources. There is real potential to make Baltimore an example of how we can provide access to healthy, green spaces for everyone — even in developed urban areas. I am proud to participate in these efforts to revitalize our city and build a greener, more sustainable future. And I will work closely with our federal agency partners in bringing attention to these great projects and finding resources to help turn this vision for Baltimore into reality. Top image: The Baltimore CPAT team, from left, Ryan Scherzinger; Michael Dorsey; Catherine Mercier-Baggett, AICP; David Rouse, FAICP, ASLA; Brandy Brooks; Neil Weinstein, AICP, PE, ASLA; and Garlen Capita. Photo from final CPAT report. 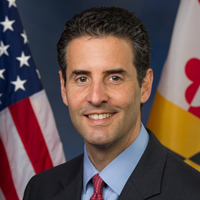 Congressman John Sarbanes has represented Maryland’s Third Congressional District — which spans portions of Anne Arundel County, Baltimore City, Baltimore County, Howard County and Montgomery County — in the U.S. Congress since 2007. He currently serves on the House Committee on Energy and Commerce, in addition to the Subcommittee on Health and the Subcommittee on Energy and Power.